Vladimir Lenin was a Russian communist revolutionary, politician and political theorist. He played a senior role in orchestrating the October Revolution in 1917. 3 Let no man deceive you by any means: for that day shall not come, except there come a falling away first, and that man of sin be revealed, the son of perdition; Мф 24, 4. Мк 13, 5. Лк 21, 8. Еф 5, 6. 4 Who opposeth and exalteth himself above all that is called God, or that is worshipped; so that he as God sitteth in the temple of God, shewing himself that he is God. Дан 11, 36. Откр 13, 1. 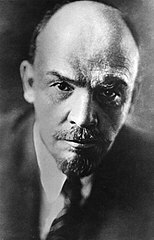 Vladimir Lenin: “all worship of a divinity is a necrophilia” ≡ “exalteth himself above all that is called God, or that is worshipped” (2Th.2:4). … To talk about god-seeking, not in order to declare against all devils and gods, against every ideological necrophily (all worship of a divinity is necrophily — be it the cleanest, most ideal, not sought-out but built-up divinity, it’s all the same), but to prefer a blue devil to a yellow one is a hundred times worse than not saying anything about it at all. … Just because any religious idea, any idea of any god at all, any flirtation even with a god, is the most inexpressible foulness, particularly tolerantly (and often even favourably) accepted by the democratic bourgeoisie — for that very reason it is the most dangerous foulness, the most shameful «infection». Lenin was a passionate and convinced atheist and hater of religion. Lenin had almost a genius for blunt coarseness, and such was his style. Lenin particularly hated any attempt to combine Christianity with socialism. The very internationalism of the Russian communist revolution is purely Russian and national. I am inclined to think that even the active share of the Jews in Russian communism is very characteristic of Russia and the Russian people. Russian messianism is akin to Jewish messianism. Lenin himself is a typical Russian. In his characteristic, expressive face there was something Russo-Mongolian. In Lenin's character there were typical Russian traits, and those not specially of the intelligentsia but of the Russian people — simplicity, wholeness, boorishness, dislike of embellishment and rhetoric, thought of a practical kind, a disposition to nihilist cynicism on moral grounds. In several ways he recalled the Russian type which found expression in the genius of L. Tolstoi, although it did not overcome the complexity of Tolstoi's inner life. Lenin was made of one piece; he was a monolith. The part played by Lenin is a notable demonstration of the rôle of personality in historical events. Lenin could become a leader of revolution and realize those plans of his which had been worked out long before, because he was not a typical member of the Russian intelligentsia. In him characteristics of the Russian sectarian intelligentsia existed side by side with characteristics of the Russians who had made and shaped the Russian state. He united in himself traits of Chernishevsky, Nechaev, Tkachev, Zhelyabov, with traits of the Grand Princes of Moscow, of Peter the Great and Russian rulers of the despotic type. In this lies his originality. Lenin was both an out and out revolutionary and a statesman. He combined revolutionary ideas of the extremist type and a totalitarian revolutionary outlook with flexibility and opportunism in the means employed in the struggle and in political practice. It is only such people who are successful and victorious. He combined simpleness, directness and a nihilist asceticism, with astuteness, almost with cunning. Lenin was made of one piece; he was a monolith. The part played by Lenin is a notable demonstration of the rôle of personality in historical events. … Lenin was both an out and out revolutionary and a statesman. He combined revolutionary ideas of the extremist type and a totalitarian revolutionary outlook with flexibility and opportunism in the means employed in the struggle and in political practice. It is only such people who are successful and victorious. He combined simpleness, directness and a nihilist asceticism, with astuteness, almost with cunning. In Lenin there was no trace of revolutionary bohemianism — a thing he could not bear; in this he was a contrast to people like Trotsky or Martov, the leader of the left wing of the mensheviks. In the year 1918, when chaos and anarchy threatened Russia, Lenin made unheard of efforts in his speeches to discipline the Russian people and the communists themselves. He appealed to elementary things, to labour, to discipline, to a sense of responsibility, to knowledge and learning, to positive constructiveness, and not to destruction only; he inveighed against high-flown revolutionary talk and exposed anarchic propensities. He exorcized the abyss and he checked the chaotic collapse of Russia; he checked it by despotism and tyranny. In these ways he is like Peter. Lenin was not a theoretician of Marxism like Plekhanov, but a theoretician of revolution; everything he wrote was but a treatment of the theory and practice of revolution. He never elaborated a programme; he was interested in one thing only — the seizure of power, and the acquisition of strength to achieve that; and for this reason he triumphed. Lenin's whole general outlook on life was adapted to the technique of revolutionary conflict. He alone, long before the revolution, gave thought to what would happen when power had been seized, and how the power was to be organized. Lenin was an imperialist and not an anarchist; his whole thought was imperialist, despotic. Lenin's purpose, which he followed up with unusual logical consistency, was the formation of a strong party representing a well organized and iron disciplined minority and relying upon the strength of its integrated revolutionary Marxist outlook. The principle of a selected minority. Dictatorship issued from Lenin's outlook as a whole. He drew up a plan of revolution and revolutionary seizure of power which by no means relied upon the development of consciousness among vast masses of workmen and upon the objective economic process. Dictatorship issued from Lenin's outlook as a whole. He even formed his general outlook to conform with the principle of dictatorship. He asserted dictatorship even in philosophy and demanded the dictatorship of dialectic materialism over thought. enin was an anti-humanist as he was in anti-democrat; in this he was a man of the new epoch, an epoch not only of communist but also of fascist revolution. Mussolini and Hitler are to imitate him. Stalin will represent the final type of dictator-leader. Leninism is not, of course, fascism, but Stalinism is already very near fascism. Democracy is unnecessary and harmful. The dictatorship of the proletariat will mean cruel violence and inequality. With socialism all democracy will die out. The preliminary phases of communism cannot give freedom and equality. Lenin says this frankly. The dictatorship of the proletariat will mean cruel violence and inequality. Regimentation, coercion, iron-dictatorship must be passed through first of all. How and why will the violence of coercion, the absence of all freedom which characterizes the transitional period leading to communism, the period of the dictatorship of the proletariat, be brought to an end? Lenin's answer is very simple, too simple. Regimentation, coercion, iron-dictatorship must be passed through first of all. The coercion will be exercised not only upon the remains of the old bourgeoisie but also upon the workman and peasant masses, the very proletariat which is the dictator. Later on, Lenin says, people will become accustomed to preserving the elementary conditions of social life and adapt themselves to the new circumstances, and then the use of force upon people will be abrogated. The State will die out. Dictatorship will come to an end.